Hear Ben and Anne as they lead a Blue Sky Q&A for professionals from around the world. Includes the Blue Sky approach to creating a personalized, multi-year life vision and the crucial importance of an intensely focused, deeply supported process for bringing that vision to life. Coming soon. 1. Is this really a “new” Blue Sky Master Class? I was first exposed to the ideas in Blue 2017 in a private workshop with one of the most impressive psychologists I have ever met: Elliot Aronson. He was incredibly famous, successful, eloquent…and fun. One of the real rock stars of psychology of his or any other time. He was not only a brilliant researcher but he had everything else: a wonderful marriage, friends, happy kids. He was also a sensational, authentic, spellbinding teacher, unpretentious, approachable, warm, the best writer in psychology, and if that were not enough, as one of his book reviewers noted, “He was handsomer than most of (the rest of us)” as well! He ran amazing encounter groups, often co-leading them with his wife Vera. He was even recently named #28 on “An Incomplete List of (the 100 Most) Eminent Psychologists of the Modern Era,” a very select group, indeed. Like most graduate students in the helping professionals, I admired Elliot and even once hitched to Maine for a transformative two-week NTL encounter group for 37 professionals that he led along with five colleagues–one that was, again, focused on individual transformation. I’ve since done a fabulous interview with him on the occasion of the publication of his extraordinary memoir, Not By Chance Alone. If anyone seemed to know the secret of success, he was my guy. And so years before, when he and his wife offered a workshop on, in effect, “How to Create a Life You’ll Love”, I took it. And found it both amazingly simple and effective. It was not constrained by the limits of peer reviewed research anymore than most of his intuitive interventions when running an encounter group. I was comfortable with someone getting out in front of the science. I loved it. This was the first piece of Blue 2017. In the 8-week course, you’ll design six BHAGs (Big, Hairy, Audacious Goals*). Together they’ll comprise a very large vision of what your life could be. We have a very specific, concrete approach that guarantees you can succeed at this–designing a vision much bigger than you’ve ever done before. Then you’ll use backward planning to back yourself back into the present. We’ll integrate the cutting edge research of such scholars as Peter Gollwitzer, Dan Gilbert, and Gabriele Oettingen. Then we’ll show you how to create the blazing focus and social support you’ll need as you bring it to life. You’ll learn to do this first for yourself and then for your coaching clients. And you’ll walk out with an outline of how to lead a virtual or in-person workshop for groups of any size as well. This class has brought about transformative changes for many graduates and regularly receives extraordinary evaluations. *Collins, J.& Porras, J. (July-August 1999). Turning goals into results: the power of catalytic mechanisms. Harvard Business Review. Most of us think far too small. Even the big dreams that we have are almost always constrained by our hidden blinders. This is especially true for consultants, coaches, teachers and and other helping professionals who are not used to creating BHAG’s (big, hairy, audacious goals). Yet if you think back over your life and remember the most important accomplishments you’ve achieved, almost always they began with and were sustained by a powerful vision. In this workshop, we’re going to hold your hand and help you create an expansive vision for your life. And we’ll be the first to tell you that an expansive vision and a dollar will buy you a paper. You need more, including practical, powerful ways to bring your vision to life. Our atmosphere will be light, reflective, and at times playful. But make no mistake, we will lead you through an exercise which will allow you to create a vision of your life five to seven years in the future–a vision that is anchored by six specific outcome goals. Then we’ll show you ways to reverse engineer these goals, backing yourself back into the present. And how to create the focus and social support to bring your vision it to life. You’ll learn to do this first for yourself and then for your coaching clients. 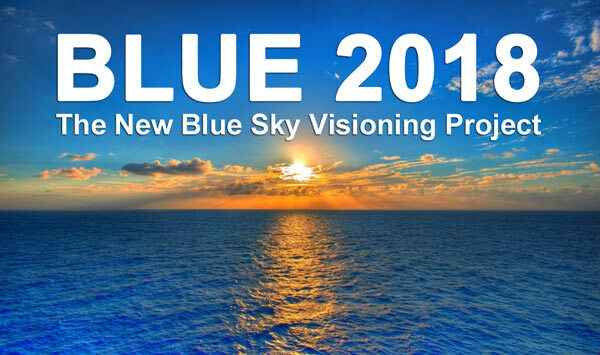 …Blue Sky Visioning provides an energizing jump start to anyone who has goals and visions, but has not been really able to realize them. …Without a doubt, the most practically useful coaching class I’ve ever seen. (Also the most profitable.) I use Blue Sky in my own life. I regularly present a killer Blue Sky workshop as well (your guidance was invaluable). And I have confidence and wonderful tools in my hip pocket for every client who wants more from their lives. … so inspiring and definitely just what I needed, … I’ve spoken to other UK dwellers who are interested in joining the next one. …perhaps the best course (of many excellent ones) I’ve taken from Mentor Coach!… The instructors were truly inspiring… exhilarating! Blue Sky, which I’ve taken twice, was very helpful in gaining clarity on what I want for my life….The tools and techniques to keep my focus and move forward have all been (invaluable). I made great and lasting connections (with other students in the class). Ben and Anne are a skillful teachers and leaders. If you want to move your life to the next level, I recommend taking Blue Sky [maybe do it twice :)]. This class provides eight hours toward MentorCoach Certification as an elective for students meeting the class attendance requirement (See #13 below.) It can also provide 8 hours toward ICF Certification via an Accredited Coach Training Program such as MentorCoach or via the ICF Portfolio Approach. Live Class Attendance. This class is pending approval for 8 CCEs (ICF Core Competencies) from the International Coach Federation for students meeting the class attendance requirement (see #13 below). There is no fee for ICF CCEs. Listening by Recording. For students who will be listening to this class by recording, this class is pending approval for 8 CCEs (ICF Resource Development) from the International Coach Federation for students meeting the class attendance requirement for listening by recording (see #13 below). CEs. Graduates of this class will be able to earn eight hours of CEs for social workers (NASW) and Marriage and Family Therapists in California (BBS). The CE administration fee is $75. Note: The CE fee applies only if you are a licensed mental health professional in the US and need CEs from one of the organizations listed above. Otherwise, when you register, indicate that you do not need to pay the CE fee when you register. Every class is recorded. Some students may listen to some or all of the classes by recording at their leisure. We applaud and support this practice. We know one well-known Australian professor who used to end his week listening to Chris Peterson’s lectures by recording on Friday evenings, drinking white wine and reclining in his hot tub. Listening by recording does not meet the requirements for CEs or ICF CCEs (Resource Development). However, listening to the class by recording does count toward the attendance requirement for receiving eight hours of ICF CCEs (Resource Development). To document your attendance for those eight hours of listening by recording, you must simply turn in all class attendance codes by a week after the last class and possibly pass a multiple choice exam on course content as well. Anne Durand, MCC, an executive coach, is the CEO and Director of Training of MentorCoach. Anne is a legendary teacher at MentorCoach who lives in Arlington, Virginia, with her husband and her 3 small dogs. Anne launched her private coaching career after 20 years as an executive for NASDAQ followed by a second successful career as a small business (art gallery) owner. Her current areas of specialization are mentoring and supervising coaches and providing individual coaching to executives and small business owners. Anne’s own coaching experience began before coaching was even a buzzword. Her first coaching client was the CEO of NASDAQ who handpicked her to help him (and his direct reports) design and navigate a delicate and complex culture change within the organization.